One of my greatest pleasures in life is putting together an itinerary for an upcoming trip. As I plan, I always look for out-of-the-box activities or hotels to add some spice to the experience. 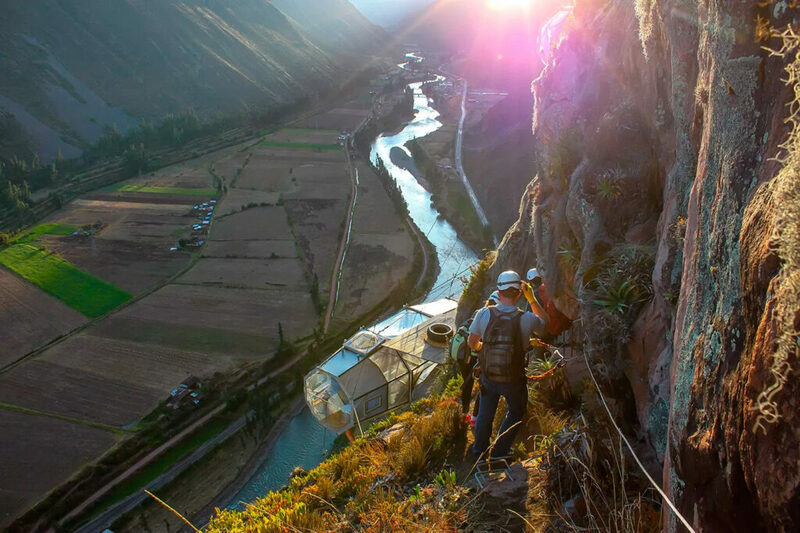 In Peru, that was the Natura Vive Skylodge in the Sacred Valley. I was taking my 18-year old nephew, Caeden, on a surfing trip to Panama and wanted to include an additional stop at Machu Picchu. Knowing that our time – and his attention – was limited, I was determined to find something especially spectacular to impress him. As I researched the route from Cusco to Machu Picchu, I stumbled across pictures of a zip line and via ferrata – a steel cable hiking line wrapped up and around the mountainside – in the Sacred Valley. Having experienced the via ferrata at Mt Nimbus in Banff, Canada, I knew it was a unique and unforgettable way to mountain climb – one that Caedan was sure to appreciate. I clicked around for more information but my search was unexpectedly halted; an image of three alien-looking modules dangling off the side of a cliff caught my eye. Looking a little closer, I realized that they were sleeping modules. We could actually spend the night up there at 1200 feet above the ground? I didn’t think twice about it: booked! ← The Skylodge Adventure Suites – not for the faint-hearted!